Damn, these woes of the heart! If you’ve ever been dumped before or have worried about being dumped, you’ll know that it’s probably one of the worst things to have to deal with. Worse perhaps, if you didn’t see it coming! In this post, I will reveal 3 SIGNS that you’re most likely going to get dumped! These signs are more specifically personality types… so if you think you can recognize some of these traits in yourself, you might want to be cautious! #1 When you love someone, it’s ALL ABOUT THE OTHER PERSON! When you love someone, you tend to go all out and make everything about the other person. You love BIG and all your efforts are pooled towards doing things for the other person, making them happy and putting them first. While that in itself might not be so bad, you tend to “auto-neglect” yourself because maybe your life doesn’t feel very meaningful without the other person. You’re just focused on seeking your partner’s constant approval. So if you’re the type to completely lose yourself in the other person, you’re probably going to get dumped. That’s because you’re probably drawn to people who are very dominant and highly opinionated… people who have strong likes and dislikes and aren’t afraid to state them. And the “clearer” they are at expressing what they want, the more attracted to them you are. The problem with that is your partner will always want more, have more “asks”… and when you fail to fulfill some of these, it’s likely they might dump you! You love to feel strong, needed and to play “the savior” to someone who you think might be weak or broken. You’re drawn to people you think are vulnerable and might benefit from your help. Be it someone with financial issues, a drug habit, emotional or psychological problems… you love to be around people in distress. You’re drawn to them like a moth to a flame! You seek a partner who desperately needs you… maybe it makes you feel important, smart, special. Do the following traits sound familiar to you? If you see these signs in yourself, considered yourself warned… you just might get dumped! Unfortunately, when your partner eventually snaps out of the “victim” role, their appreciation of you might begin to wane. When they no longer need you, their gratitude might be fleeting and they might actually resent you for making them always feel like the “weaker” one. And oh boy, you just might get dumped! #3 Pretending to be someone you’re not! 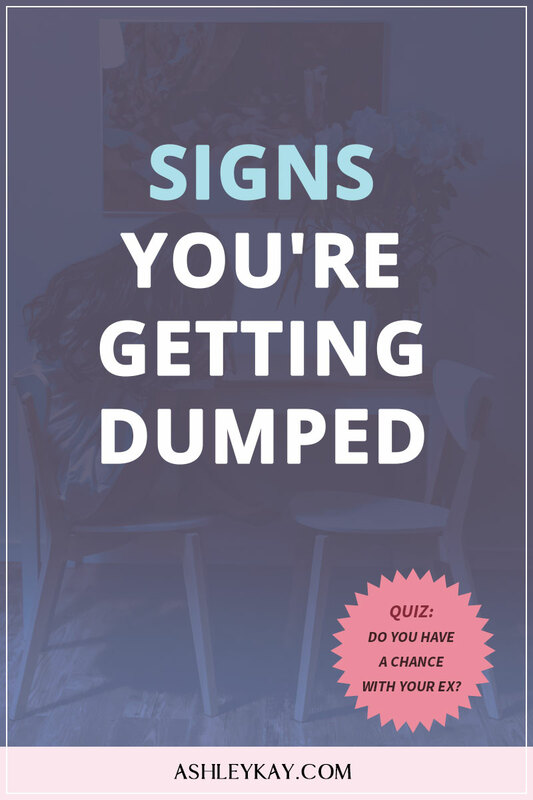 This last sign is perhaps the most common of them all and with this one, you’re just as likely to dump the other person as they are to dump you. But it really doesn’t matter because it all stems from the same problem and never ends well! If you have a tendency to “embellish” your personality with all things fanciful and project yourself as somebody you’re really not, chances are you might get dumped! People who pretend to be someone they’re actually not, are often quite compulsive about it. They can’t help but alter their personalities to please other people when dating! But if you feel the need to be dishonest about who you are around your partner, you’re likely to resent them eventually because you just can’t be the person you really are. You’re constantly going to be walking on egg shells, you’ll have to watch what you do and what you say… And it can honestly be quite exhausting! It’s likely that your partner will eventually feel deceived and dump you when they realize that you’re not the person you claimed to be. OR you might end up dumping them just to beat them to it because they can’t love you for the person that you really are! So well, you now know some obvious signs that you might get dumped. If you notice some of these patterns in your romantic relationships, you might want to look in on yourself and be more mindful of these self-defeating ways! You might want to check out my popular program that’s changing lives and helping people nurture their relationships.